Oh my stars have the last several weeks flown by with both joy of the happy and bittersweet kind. 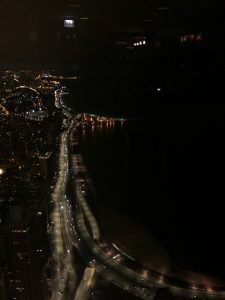 Adventures have included exploration of the Chicago Natural History Museum, ’80 & ’90s-themed milkshake bars, the “World’s Best Fried Chicken”, the creamiest of ice creams, the Art Institute, green rivers, the Cheesecake Factory Experience, nostalgia of Broadway, and a magical view of the city. Many of the sites to see in Chicago often involve the extensive history of the city, and remnants of the current culture to remind us where we’ve been and the direction in which we’re heading. As a classical studies student, I have come to greatly appreciate the various aspects of art as they exist to relay messages that otherwise could not be expressed through words. Storytelling is a valuable heirloom of the people that tell it. The older I get, the more I realize that I know nothing. Throughout my time in the city, I have come to desire a deeper understanding of things to which I had never even given thought. It is unique how Chicago displays its character among its streets. 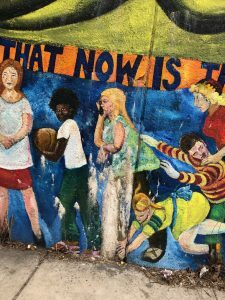 Passing through various neighborhoods, I have seen in each one, at least, one mural that reveals the community’s feelings on social or civil matters. And, it is an outlet through which many individuals have the opportunity to speak their opinions in a constructive manner. Being a Holland native, I have not been exposed to the many definitions of hardship and adversity that Chicagoans have to endure. 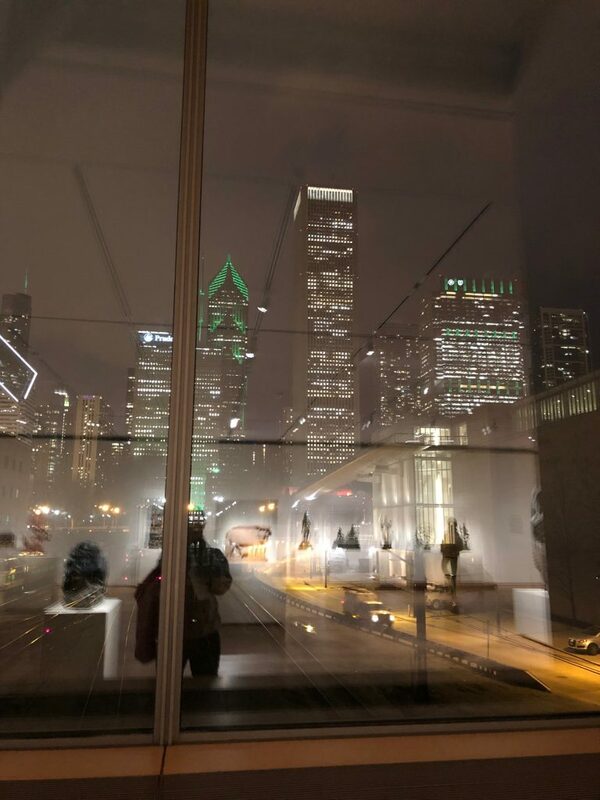 To see these experiences drawn, literally, on the streets of the city points to the profound struggle that a metropolis, like Chicago, has to reach a point of success. If I’ve learned anything in this internship and city experience, it is that listening to other people’s (both individual and as a community) stories is the first step toward social change. I have begun a new world of advocacy and affecting change to the things that are broken in this world. This is a mural found underneath the highway near Chinatown. No weekend in Chicago suffices if you don’t gorge yourself with delicious, fat-filled food. 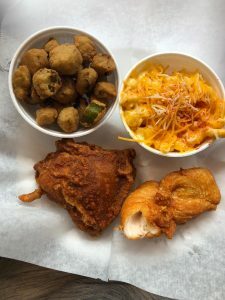 What better way than with Southern food at Gus’s World Famous Fried Chicken? 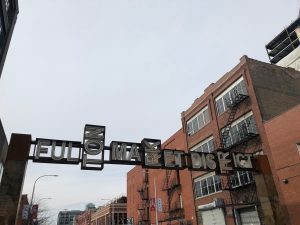 Fulton Market in the West Loop offers plentiful food options for Chicagoans that represent the true melting pot the city is. The food was so delicious and just like what you’d get in the South. 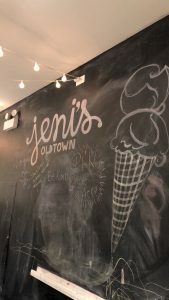 If you ever ask about the must-go-to places in Chicago, just about everyone will mention Jeni’s Ice Cream. Boy oh boy, is that the creamiest ice cream I’d ever tasted. 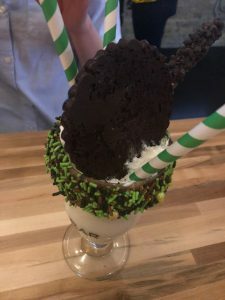 Even creamier than Hudsonville Ice Cream, which (for those who are familiar with the local company) is a feat in itself. While there are several locations around the city, my favorite one is in Old Town (which is about a 15-minute walk away from my apartment). The neighborhood has a small-town feel to it while still retaining the charm of city life. 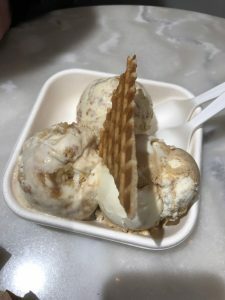 Jeni’s absolutely lives up to its reputation! I’ve been told that Chicago summers are to-die-for, and Jenni’s ice cream would be the perfect middle-of-the-day respite from the Midwest (haha) heat. 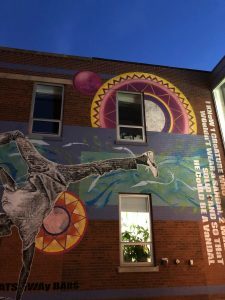 From the beginning of the semester, I had my heart set on visiting the Ukrainian Village because of the interesting culture and food! How lucky was it that our Chicago Semester faculty lives right in the neighborhood and suggested trying Tryzub Restaurant? Let me just say, the wait was worth it! Even though the services did take a long time, the food was of the quality that you melt as soon as it touches your taste buds. I ordered a goulash and fried potatoes (not French fries!). It looked like a pot pie, with a crust covering the tomato-based beef-potato-vegetable insides. Finally, the pit-stop of all dessert places, the Cheesecake Factory. 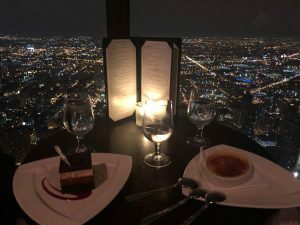 Right along Michigan Ave., the restaurant is located in the “basement” of the John Hancock Building. 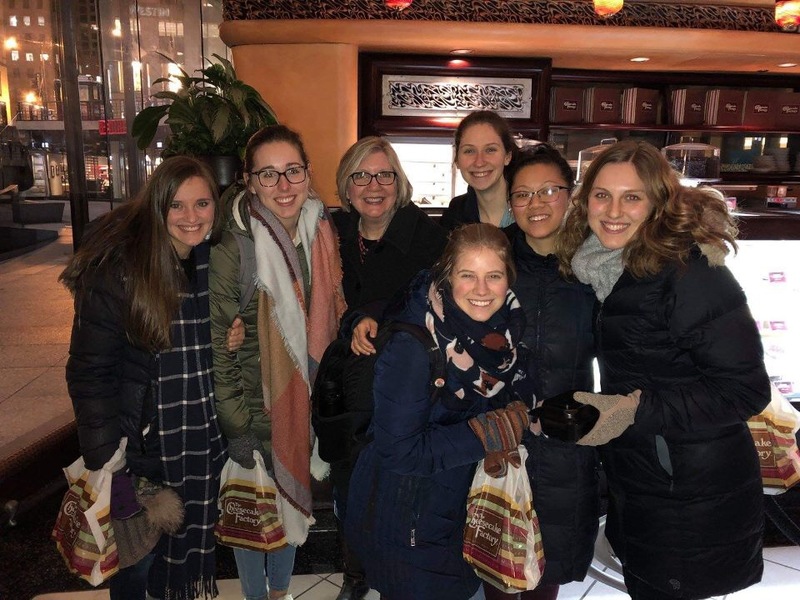 The dean of the nursing department, Dr. Garrett, was in the city for a conference and invited all the nursing students to join her. While I got no picture, the mango key-lime pie that I ordered was “oh-so” tangy and sweet and every sort of goodness one could think of…sometimes I dream of that cheesecake. Overall, it was a nice evening out with an opportunity to catch up with a beloved professor. With all the new faces and experiences, it was a comfort to see a familiar one. In addition to filling up with food, I’ve been saturating myself with as much art and history as my introverted self allows. 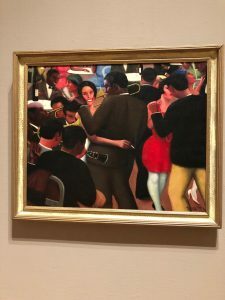 One fantastic thing about becoming a resident of Chicago is that there are many free museum days for residents. 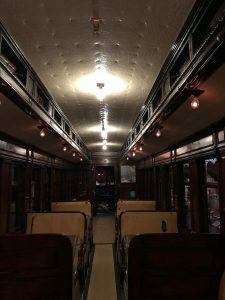 So, Tuesday nights are for the Chicago History Museum; everything from Al Capone to the original L-train cars. I could’ve easily spent several hours looking further into the details of the history. The whole purpose of museums is to increase the community and visitors’ awareness of historical mistakes and successes, right? Well, they certainly fulfilled that design. Another place that encourages original thought and creative inspiration is the Art Institute of Chicago. The four enormous floors of the museum makes it impossible to enjoy all the exhibits in one mere visit. Of the ones I did visit, there was much to appreciate. The artists harness their talents, no matter the medium or outlet, and offered a piece of insight into their thoughts, emotions, passions, and desires toward change. Below, I included a picture that depicts a jazz club (maybe) circa late 1940s. I love this because it captures the essence of African Culture during this era in Chicago. Booming with the smooth sounds of jazz and blues, the heart of the city can be found in the sounds and views of arts. Caroline (my friend pictured in the Tryzub picture) joined us for St. Patrick’s Day. We started off the weekend watching the river turn green, and the remainder was spent mostly relaxing. 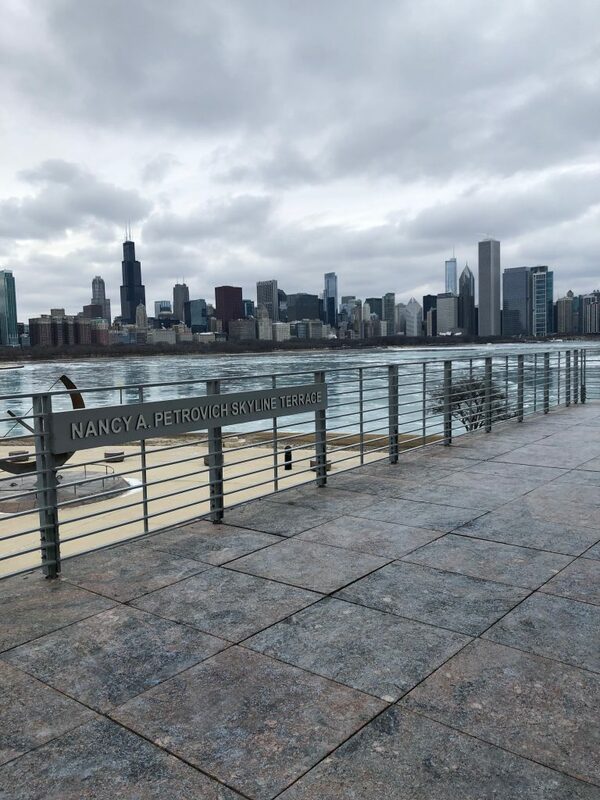 While it was very chilly and windy on that Saturday (March 16th), it was fun to experience the energy and enthusiasm that native and visiting Chicagoans exude for the holiday. Irish pride is boasted! So far, just about everyone in the Chicago Semester program created a bucket list of things to do in the city. 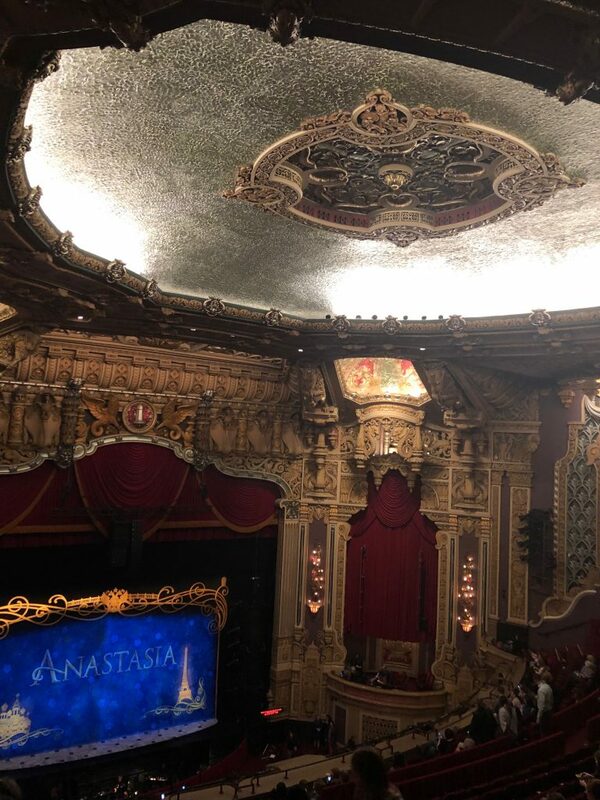 One of mine was to see (I know, super specific) Anastasia on Broadway. One of the other Chicago Semester students, Hannah, is a theatre major. Obviously, she was an avid Broadway aficionado. We snatched fairly inexpensive (we are college students after all) tickets and went to the play on April 2nd. As someone who grew up watching the movie, I anticipated the changes they would make to adapt it to the stage. Let me just say, people are so talented, beyond belief sometimes. From the lighting to the music to the singing, stage magic brought the story alive. And, that’s where I’ll leave that. 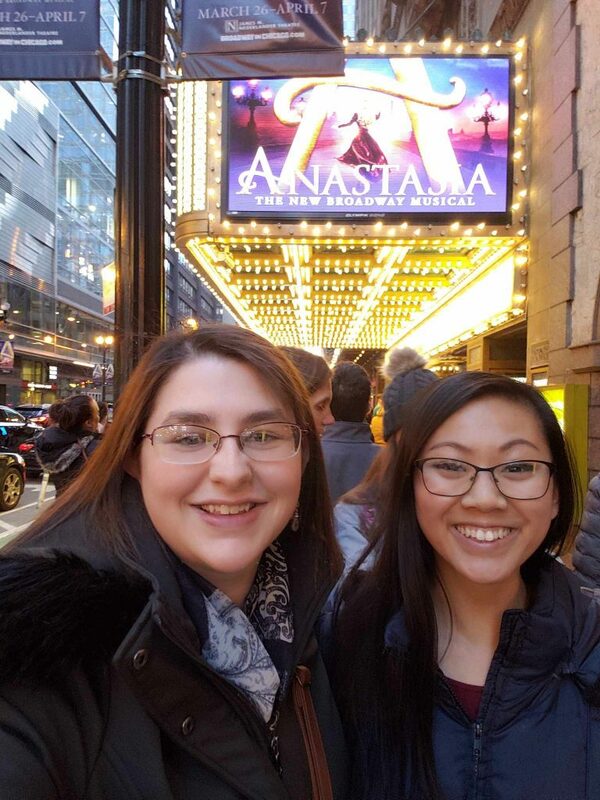 Not much else to say, other than GO SEE ANASTASIA. On the internship front, I have seen so much learning and mini/major-goal achievements. I have finally made my way through the four perioperative units: gastrointestinal laboratory, operating room, post-anesthesia recovery care unit, and pre/post-operative unit. In each, the nursing skills remain the same, and my nursing assessment is constantly being refined through the tips and tricks of the nurses mentoring me each day. Within the specialty units, I have been catching onto the procedures rather quickly and am eager to apply these skills to my first job. Over the past several months, I have been in the works of applying to graduate school and deciding which one to go to. After much careful thought, I have landed on Wayne State University in pursuit of my doctorate in nursing practice with an emphasis on adult-gerontological acute care nurse practitioner. I am more than eager to learn how to balance full-time work and graduate school, and to improve how I provide care even further. With less than a month until graduation, I am becoming more and more restless to come back to Holland and graduate (serious senioritis kicking in!). Yet, I am eager to make the most of the rest of my time in Chicago. The weather is finally hitting above 40 degrees, where it’s finally bearable to wear a light spring jacket (I guess Midwest weather is the same no matter what state). I’m reminding myself to live in contentment as Paul instructed us to do, and relish each moment as it comes. 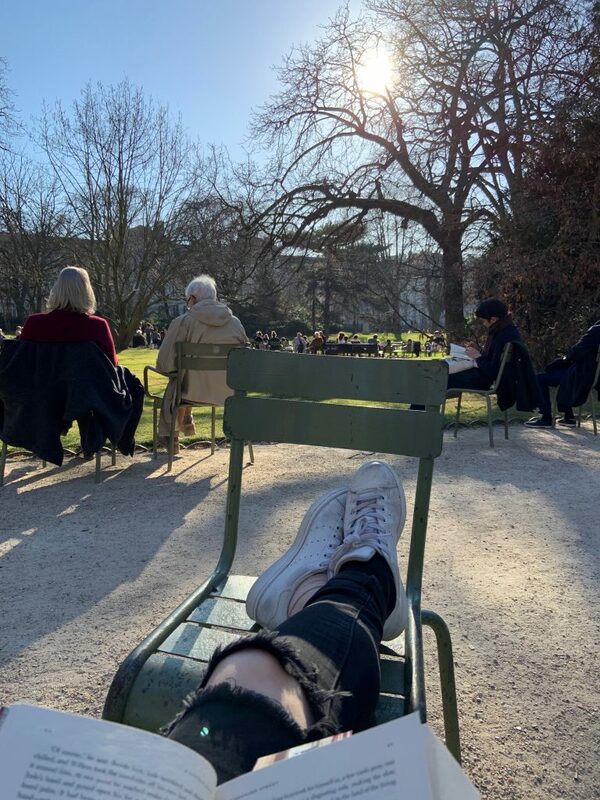 Posted on April 18, 2019 April 16, 2019 Author Annie DokterCategories UncategorizedLeave a comment on One Month Left Until Graduation! 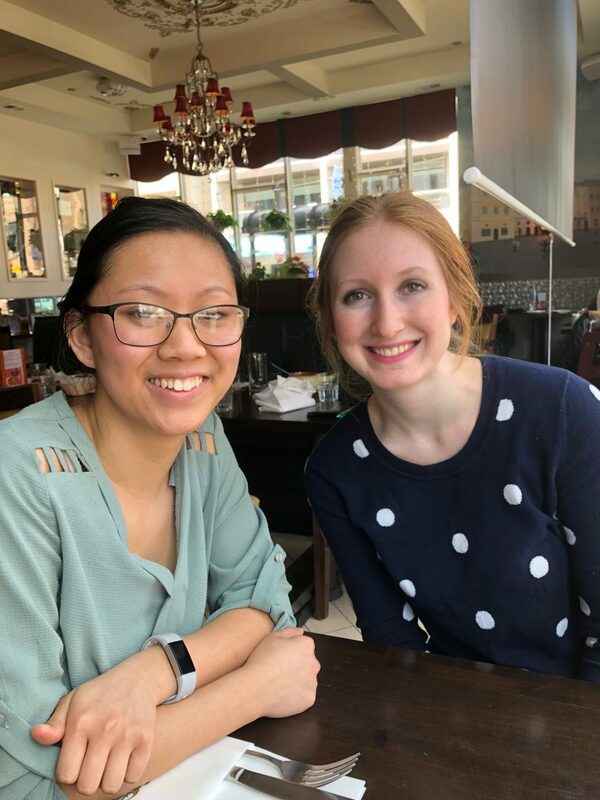 Perhaps you remember reading my post about Lili and Edwin (posted February 3rd), and how they were such a huge answer to prayer for a class schedule for the semester, for friendship, and for a faith community. They are the leaders and business owners of their organic produce business, named Nativo, located in Lumbisí. The joy and peace I felt when I met them at the end of January has continued to be so abundant, throughout the duration of the semester. For a bit of cultural context, Lumbisi is a small community with indigenous heritage and is a neighboring community to where I live in the valley of Cumbayá. It is an area of families who own land and cultivate their own crops, but would be socially considered lower class. 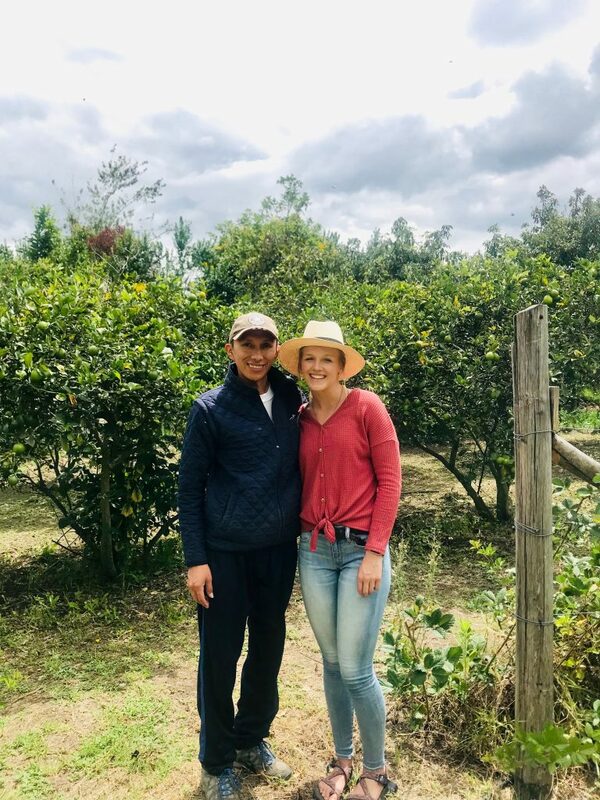 What differentiates Lili and Edwin’s business from the rest is that their product is all organic and they have enough family land to produce enough for their household, and to sell. I have had the opportunity, through IES Abroad, to take Service Learning as a class this semester. I feel so blessed by my placement with Lili and Edwin! They have the kindest hearts for service to their community, and the neighboring ones as well. They make organic produce affordable for those who would otherwise never bother to eat healthy, and they teach their clients the importance of caring for their bodies. They are the most genuine people I have ever met and their faith is what guides them through each and every day. I truly admire Lili and Edwin for the work that they do for their community, and for the faith they continue to display, no matter the situation. They live in a community where they are “weirdly different.” Lili and Edwin both had the opportunity to study at universities in Ecuador, unlike many in Lumbisí, and they want to share their knowledge for the benefit of the entire community. Also, they don’t have friends in their community that are Christian, so it is difficult at times to develop deep connections with their neighbors. Despite these challenges, Lili and Edwin have each other and their families to help them continue to choose to serve, and be disciples to those around them. This semester I helped Lili and Edwin prepare for their weekend sales, every Tuesday and Thursday afternoon. Some days we would sort chocho for 3+ hours. 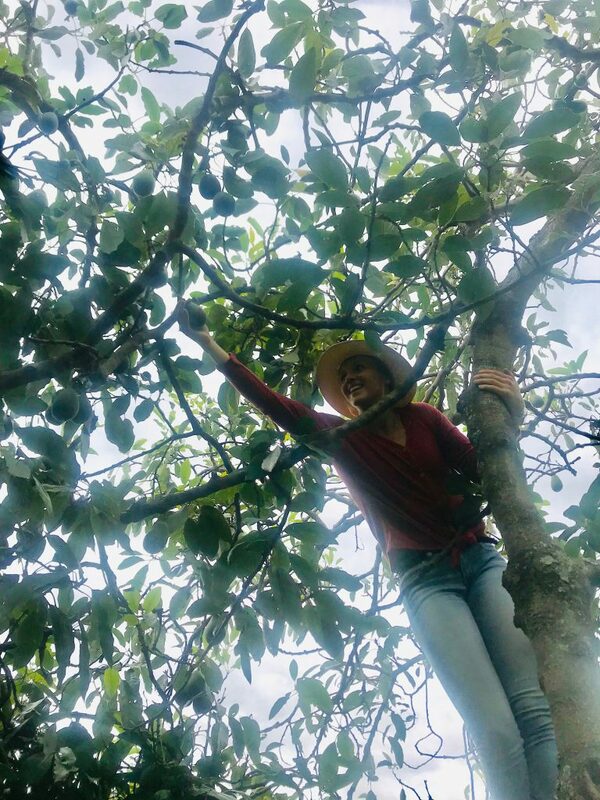 Other days we would package the produce for the weekend, and we would go to their land to harvest produce such as avocados, lemons, limes, blackberries, and guava. I think IES Abroad and Lili and Edwin would admit that this placement was a bit of a gamble, at first. Lili and Edwin had never had a volunteer before, and IES Abroad holds high standards for the Service Learning class. 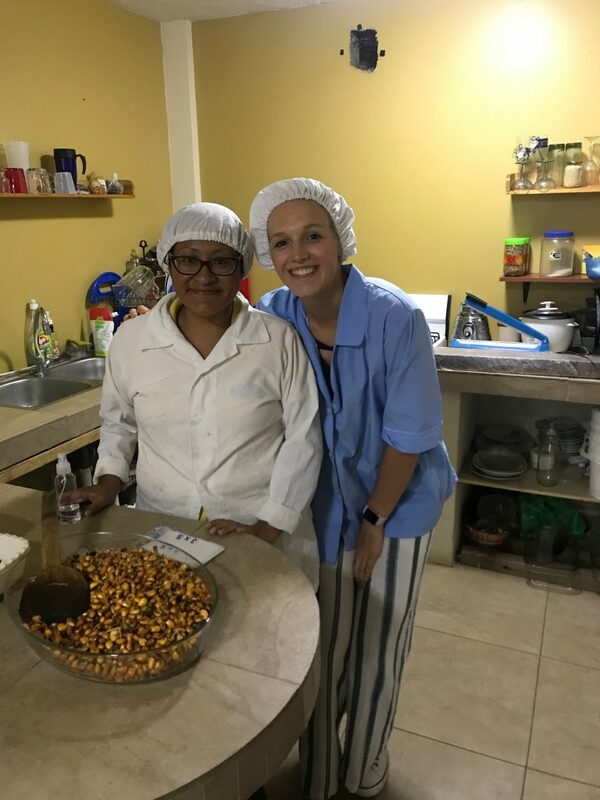 This placement surely surpassed any requirements and the experience has been valued by Lili and Edwin, my IES Program Leaders here in Quito, and me. Lili and Edwin are always prepared for they days I come. They are always teaching me new things and health benefits of the plants/produce. In the repetitiveness of the tasks, I learn more about Ecuadorian culture by talking with them for hours on end. My favorite moments of every week are with Lili and Edwin. When I am with them, I feel peace, joy, hope, needed, and so very loved. They care for me as if I am their child they and invite me to their special holiday meals. I am trying not to think about having to say goodbye to them yet. This past week, I introduced an IES Program Leader and a fellow classmate at my placement site with Lili and Edwin. After Lili mentioned how much they were able to develop as a business over these past couple months by having a set of extra hands, my program leader asked, “So, what are you going to do when Morgan leaves?” Lili just said, “Cry, we are going to cry.” Half jokingly because of the positive life view that Lili has and her continual trust that God will always provide. But, seriously in the reality that it will be hard to say goodbye to our weekly conversations and relationships. I am thankful my original schedule didn’t work out when I got here, despite the stress I felt in January because of it. I know God hand-picked Lili and Edwin to show me, through their daily love and encouragement, how to live a life of joy and peace and friendship. A life that is selfless and fulfilling, no matter the circumstances thrown our way. 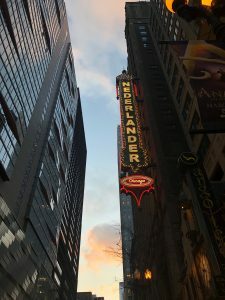 As my time here in New York begins to come to a close, I thought I’d take a moment to reflect on the differences I’ve noticed between Michigan and NYC. Given that I’m still in the United States, you wouldn’t think there would be so many cultural differences, but there honestly are! Multi-Level Stores: Everything here is so squished and condensed! It’s a rarity to walk into a store and for there to not be an escalator or two. I must have gone up at least four escalators when my roommate and I went to see Captain Marvel in theaters (it was so weird)! Even a few Starbucks here will have a partial upper floor with additional seating (because abundant seating is also a rarity in NYC). No one owns a car: Instead, everyone uses the subway, which makes sense, because the drivers in NYC are crazy! Even though the metro is dingy and breaks down frequently, it’s super convenient! It’s so nice to be able to hop on a train and simply read a book while you wait to get to your destination. I have been purchasing 30 Day Unlimited passes, which means I can take the subway as much as I want! Everything here is so much more expensive: I mean, I knew this going in, but I still mourn my wallet’s empty state. There’s no green or trees here: If you want to see trees or grass or really anything that isn’t a dull gray, you have to go to Central Park (at least in Manhattan, parks are more frequent in other places). It’s kind of a bummer. Then again, Central Park is such an expansive and beautiful place. My first time going there, I wandered around and explored, and it was really peaceful. Gray Slush: Any snow we get quickly turns into a gray slush that makes my toes freeze. I mean yes, I’m totally grateful that I missed out on that Polar Vortex everyone in Michigan was suffering from early on in the year, but I’m still kind of sad that I haven’t seen real snow this year. Who would have thought? It’s dirty and gross and smells everywhere: Might want to come with nose plugs. If not, you get used to it…somewhat. 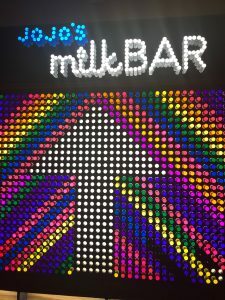 It’s easy to find your own unique corner of NYC: There’s so many events and meetups happening, it’s so easy to find your own niche. I’ve been able to go to some many writing and book events that I wouldn’t have had access to in Michigan! Never ending activity and noises: Gotta love police cars zooming by at 2am, though in all honestly, Hope has prepared me well for this with the railroad tracks that go by on campus. Diversity: There are so many different cultural corners to NYC! You have places like Koreatown, Chinatown, Little Italy, Little Poland, etc. 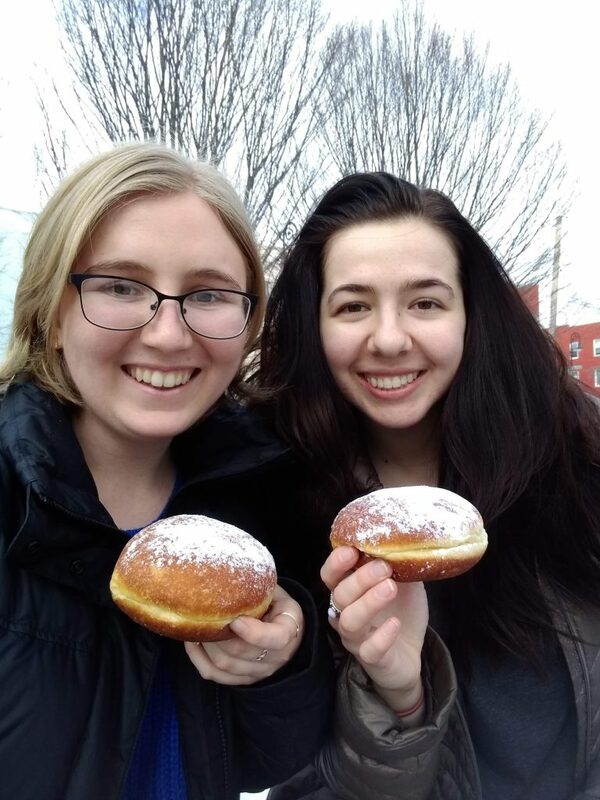 The weekend before Fat Tuesday, I made my way down to Little Poland and my friend and I got pączkis from an authentic Polish bakery. Everything is so easily reachable: I can walk out of the New Yorker and cross the street to reach CVS. Target is only a 7 minute walk away. You walk to almost any sort of store or fast food place. 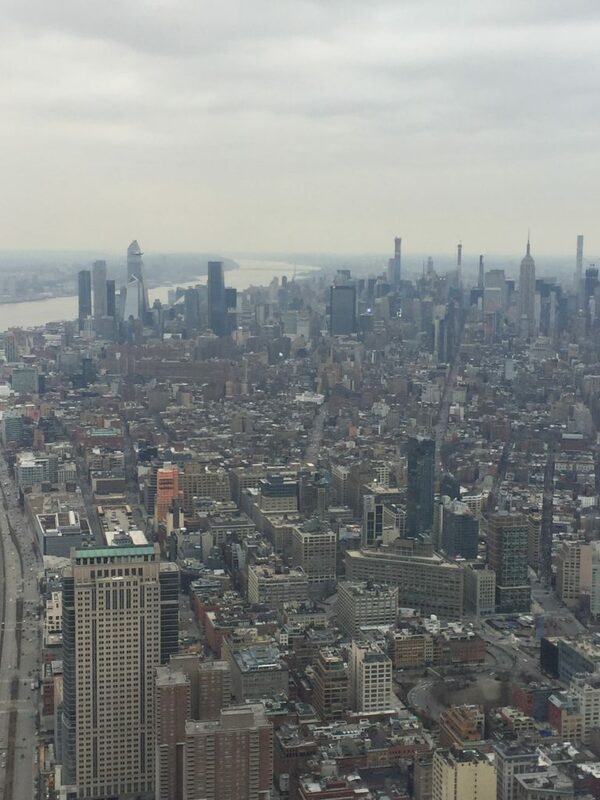 Regardless of these differences, NYC has really grown on me during my time here. I sincerely hope I’ll be able to return in the near future. 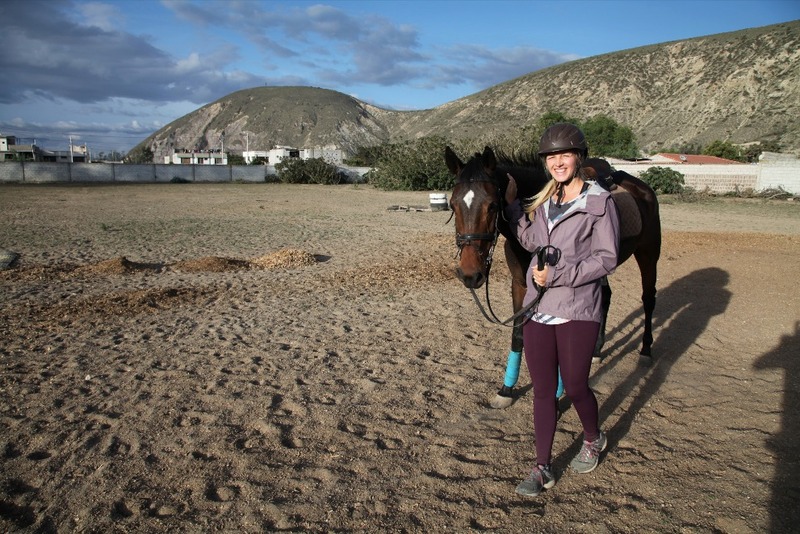 “So, how do you think your Spanish is?” This is a question I’ve been asked recently, as I complete 3 of my 4.5 months abroad, by my host mom, my biological mom, and friends. This is another one of those questions that is hard to answer from my own perspective. Though I am not the one listening to myself speak each day, throughout my experience, it is incredible to look back on the first 3 months and see the growth that has occurred in my language ability! When I arrived in Ecuador, I had just finished a summer and semester without taking any Spanish classes. I knew the vocabulary, and speaking would come back to me, but I felt apprehensive about academically using my Spanish. I knew my grammar would need a great deal of help, and let’s face it, my vocabulary was really quite small. Since I have had some shorter experiences abroad in the past, I was in an awkward in between stage of needing to try to translate things in my head before speaking, and just starting to talk out loud. I was confident that I would be able to get my point across and talk with anyone I needed to conversationally, but I knew it wasn’t going to be perfect. Throughout the course of the semester, I have improved in every area of using the Spanish language! This brings up the question once again, “So, are you fluent?” While I am obviously not a native speaker, it is universally recognized that I can’t become a native speaker. Yes, I am fluent in Spanish, and this semester has helped me accomplish my primary goals I have for using the language. As a business major, my goal is to use Spanish as a supplemental skill to my future professional life. Most importantly, I want to have the conversational capacity to develop meaningful relationships. The fact of the matter is that there is always more to learn, whether I am speaking English or Spanish (honestly, my Spanish grammar is probably better than my English). In a world where we are never done learning, we will continue to learn and grow and strengthen our skills. As I explained to my mom just this past week, it is sometimes hard to gauge how I am doing when I am not listening to myself. However, I am thankful for the confidence that I have gained to be able to use the language wherever I am, knowing that I will be understood and respected in a colloquial or professional manner. I feel so blessed to have this experience abroad; for an entire semester to be immersed! Dominating another language is something that requires taking the time to be fully immersed, and it is an opportunity foreign to the United States in comparison to the rest of the world. I don’t know where my professional life will take me, but I am thankful for the acquired skill of Spanish that I am ready and capable to use in the future! 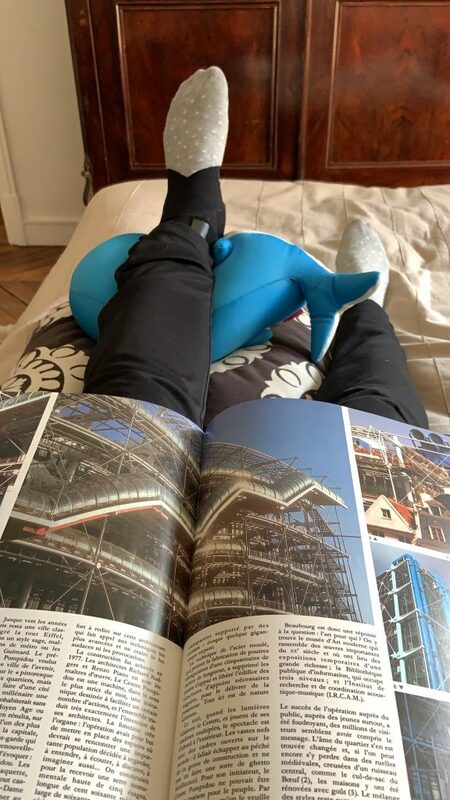 Posted on April 10, 2019 April 9, 2019 Author Morgan OverwegCategories UncategorizedLeave a comment on Language Fluency: How do you know when you have it? Over the course of the past 3 months (it has already almost been that long! 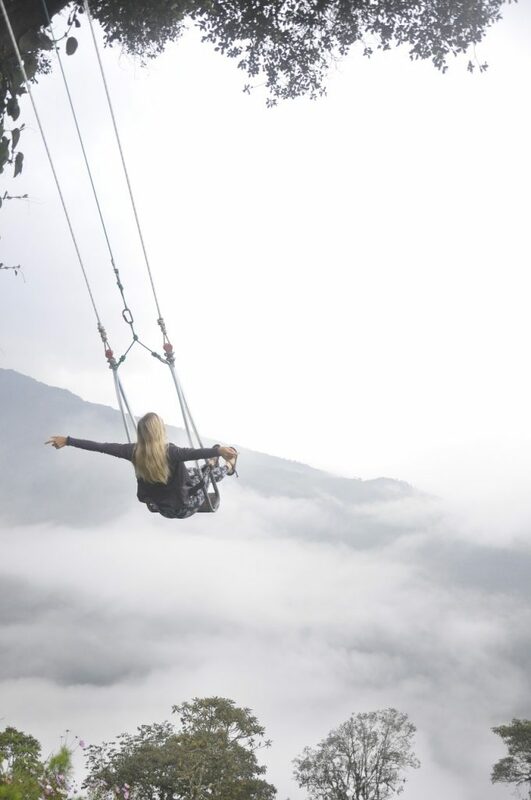 ), I have experienced new freedoms and new limitations that come with living in a new culture. Let me preface that by saying that some of these things are not necessarily better or worse than my day to day life experiences I have in the States, but rather cultural differences I am living and growing through. Travel: What a strange concept it is to be able to travel on the weekends, and choose my weekly adventure! 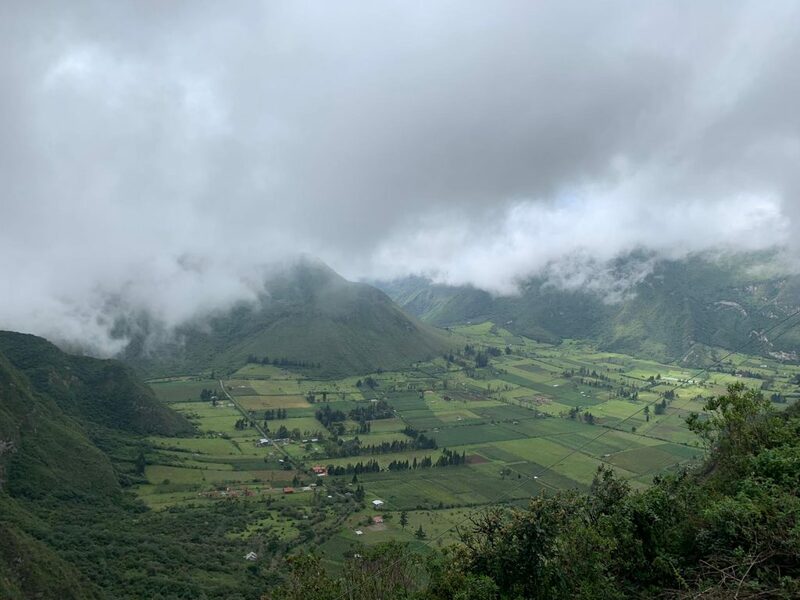 As I’ve mentioned before, Ecuador is a richly diverse country in every aspect, including it’s landscape. In the States, there is rarely the opportunity to travel somewhere for an entire weekend during the academic year. Weekends are too short and packed with homework nearly every single week at Hope. 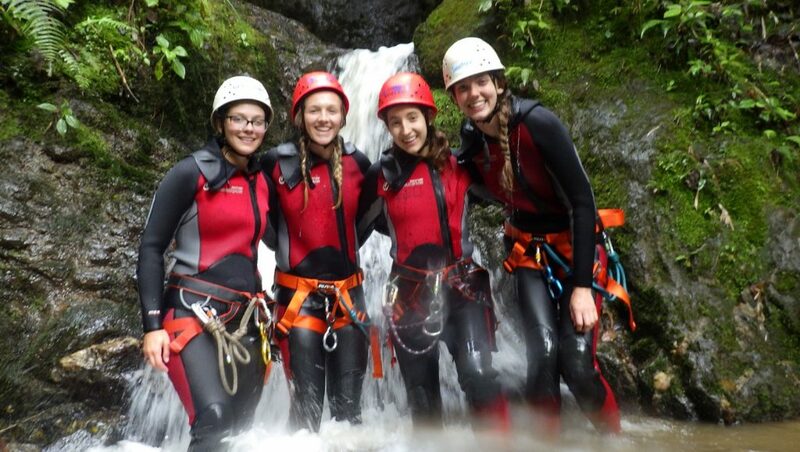 In Ecuador, the University provides 3 day weekends… (yes, that means never having Friday classes!). Academics in Ecuador seem to be a bit different, as well. While classes still have homework, tests, presentations, and group projects– there is much less “busy work.” All of the assignments tend to have a bit more weight, but they are all directly related to class material and there isn’t thousands of extra readings to be done. This makes traveling a reality, not only for the sake of time in days, but because of the decreased amount of homework than what I am used to. Not to mention the cheaper cost as well! Time: Because I am here for only a semester without my closest friends and family and jobs, I have much more freedom with time. I can read a book for fun, go for a walk, watch a movie etc., things I rarely have time to enjoy during the academic year in the states. Diet: The Ecuadorian diet is healthy, fresh, and nutritious for cheaper prices than at home. My biggest challenge is navigating life with a host family who rarely eats at home themselves. I have less control over what I eat than I do at home. Transportation: Oh how I can’t wait to be able to drive my car again! The bus system is cheap and super helpful, as you can go anywhere in the country on a bus… however, it is also very time consuming on curvy mountain roads that make me feel quite sick. Home: Being away from home just means being more conscious about everything. 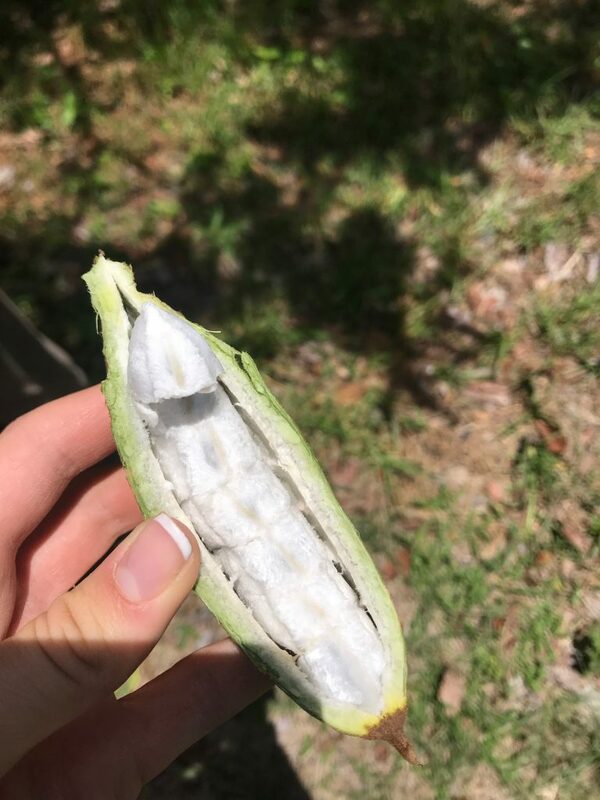 From safety, to time of day, to knowing where my food and water comes from, I’ve come to recognize the little things I take for granted at home. These are just some of the basic things that are very different than my West Michigan life in the States. There are clearly freedoms and limitations in both lifestyles that provide different experiences and opportunities. What a ride it has been, the past 3 months! I am privileged to say that I have now participated in two Women’s Marches, in two capitals of the world. Back in 2017, after Trump was inaugurated, I traveled overnight to our nation’s capital, Washington D.C., with a bus full of Hope faculty and students. These are experiences I will never forget because they are the moments in which I truly feel like I have acted out the words that my favorite black female activist, Angela Davis, said at a time when the Black community was at its height after the civil rights movement. She said, “I am no longer accepting the things I cannot change. I am changing the things I cannot accept.” Not to my surprise, the lovely women of color I protested with even quoted her on one of their posters, in Spanish of course. Words on this screen can’t do the experience justice, so I can tell you better in video. Watch my video below to relive this once in a lifetime experience with me. I have been wondering, I mean wandering, through the new-to-me neighborhoods of Bridgeport, Hyde Park, Bronzeville, Old Town, River North, and Westloop. Amidst the bustle of the friendly city, I have been finding myself struggling internally with my observations. Earlier this week, I saw a homeless man in a wheelchair on the train. You might ask how I knew he was homeless, and I would point out the too-big winter jacket, odd smell, and multiple bags that he carried with him. Among all these, what caught my eye were his hands; they looked raw, were shortened to almost the knuckle, and were black (not skin color, but his tissue). It is fairly easy to spot those who “have” versus those who “do not have.” These people have to carry all their worldly belongings everywhere they go. I wonder how people can reach a point of hopelessness that they give up in their attempts to escape homelessness. Wonder about the painful experiences individuals must have gone through to turn to substance abuse, to cope and dull the sharp pangs of their past; Wonder what I can do. In the past few weeks, God has been convicting me of my less-than-grateful attitudes. As I recognize this population’s daily struggles, I realize it is more than I have ever had to endure in my entire lifetime. Amidst my wrestling with this large societal problem, I often hear my peers and myself complaining about minute hiccups of our privileged lives. Living in the city has called into question my priorities in life and how I am living out the Word in a real sense. If we are called to be active hands and feet of Jesus Christ, I need to change my attitude toward humility and gratitude. I think as humans, it can be very easy to gravitate towards focusing on the negative aspects of life. Yet, when we strive actively to choose thankfulness, we find a kind of contentment that is beyond human comprehension. All this does not diminish the pain or suffering with which everyone struggles. I recently have dealt with the heartbreak of seeing a very dear loved one begin to pass from this temporary world into the arms of eternity. I cannot help every single homeless person I pass on the streets. But, I can smile at them. I can look them in the eyes to try to understand their pain. I can ask them how I can pray for them. I can treat them like the humans they are. Thank you for listening to my internal w*nderings. I believe it is a healthy thing to process these types of issues in a more public manner. I hope that you are able to consider my personal struggles and how we can all contribute in our Spirit-led callings to the world around us. That is what off campus study is about. Yes, about exploring and having fun. But, it also includes widening our worldview to understand callings and purpose in the global perspective. Stay tuned for the next post (coming very soon); I will be adding some of the fun portions of the last several weeks! 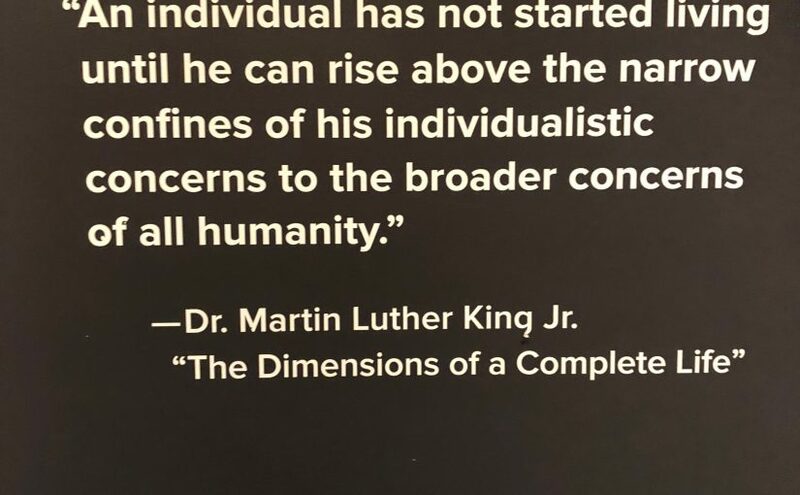 Fun fact: the featured image is from the Chicago History Museum that highlights the work of MLK Jr. I just really liked this quote that really emphasizes the importance of finding your vocation in whatever career you’re in.